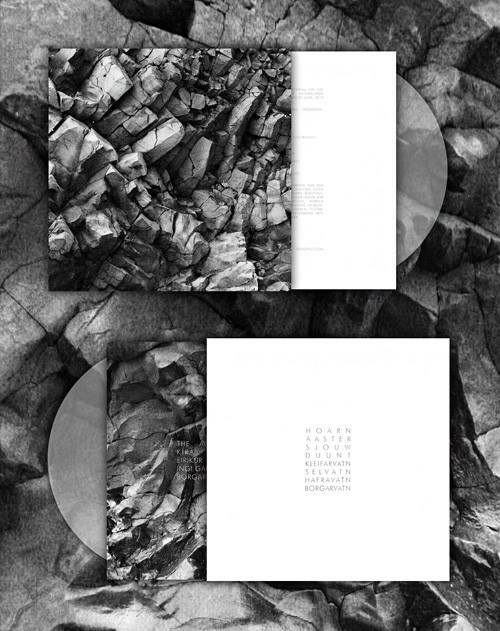 Skeylja is the outcome of a collaboration between the Alvaret Ensemble, and the Icelandic musicians Ingi Garðar Erlendsson, Kira Kira, Borgar Magnason and Eiríkur Orri Ólafsson. It is now available for pre-order, with two out of the eight tracks available online for listening. Click here to be taken to the Denovali website page for this release. “Skeylja is an international multimedia project, based around the ideas of improvisational music and the coming together of musicians from different countries and musical backgrounds to create a spontaneous sonic landscape. The project started when The Alvaret Ensemble (Greg Haines, Jan & Romke Kleefstra, and Sytze Pruiksma), who you may know from their eponymous debut on Denovali in 2012, travelled to Iceland to try to find a shared music language with the Icelandic musicians Ingi Garðar Erlendsson, Kira Kira, Borgar Magnason and Eiríkur Orri Ólafsson . They were joined by the 33 1/3 Collective, a group of visual artists from the Netherlands, who began to collect footage that would later be used as source material for the visual side of the performance. Some months later, after a successful week of traveling to beautiful locations and playing music together, the group met again, this time during the Oerol festival on the island of Terschelling in the Netherlands, for a series of nine sold-out shows in an old church, all of which were being recorded. Each artist “curated” a rough plan for one evening, which could be anything from hand-drawn images to be interpreted musically to more precise plans of structures and combinations of musicians to be explored. Never were the notes, or the content of the music itself, discussed – this was instead left up to chance and developed through listening intently to each-other, trying to create an atmosphere where each player was vital, but where everyone always worked towards the whole. After ten intense days on the island, all that was left were the memories of the audience and, luckily, a hard-drive with over ten hours of recorded music. After everyone had had a chance to listen back to rough mixes of each night and make comments, the material was taken to Greg Haines’ Electricity Works studio in Berlin, where the long process of selecting, editing and mixing began. Finally, almost two years after that first initial meeting in Reykjavik, the album is complete and ready to be released into the world. We hope you enjoy it.